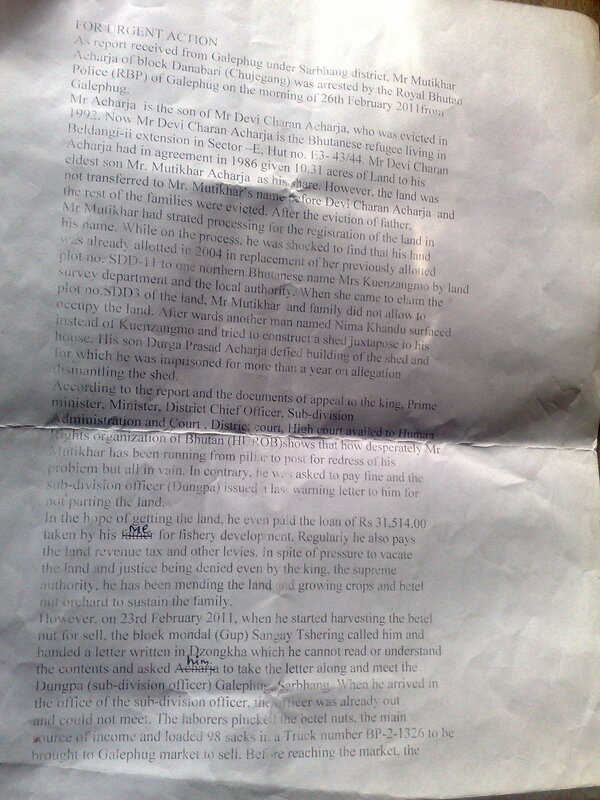 An innocent farmer arrested in Bhutan and his arrest is not yet known to his family members. 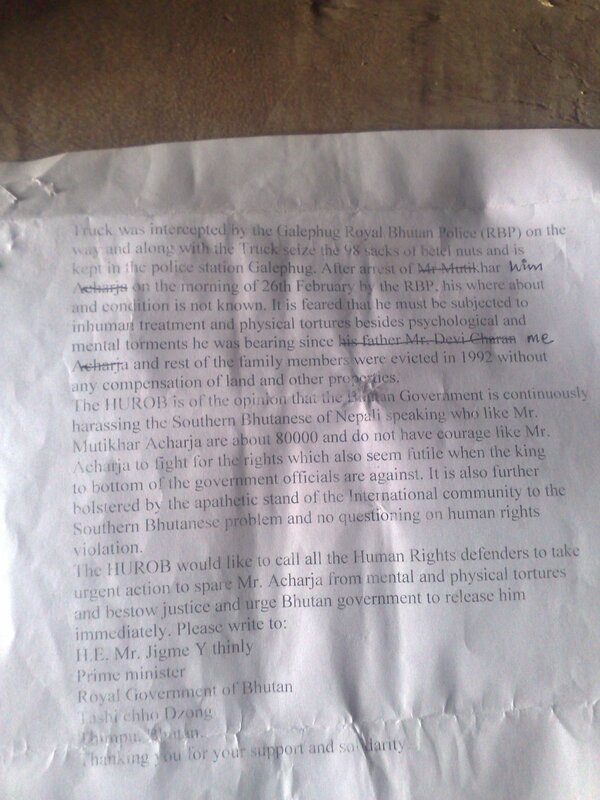 It revels the degree of brutality of the Bhutanese Government to the citizens. His father at Beldangi camp appeals concerned personnels, forums, agencies, organization and all to help him release and disclose his present condition. Dzongdas across the country will now have an additional role to play. With the signing of performance compacts with the health ministry, they will now be working together with health officials to improve hospital services. Yesterday, dzongdas from Paro, Punakha, Thimphu, Wangduephodrang, Haa, Chukha, Gasa and Samtse committed to perform this responsibility by signing the compact with chief medical officers and district health officials of each district as well as the health secretary and director general. One of the clauses of the compact on hospital administration and management transformation (HAMT) is to monitor the shortage of drugs and health personnel in all health facilities at the district. It would assure that a doctor or a health assistant is always available in a health facility. Director general Dr Dorji Wangchuk said the average waiting time for each patient is supposed to be 20 minutes across country, which is not happening today. “With this compact signing, we will have to make sure that the average 20 minutes waiting time for patients is met,” he said. Transformation said Dr Dorji Wangchuk means improvement of management, meeting shortages of drugs, staff and procurement of better medical equipment. “This will also help in using medicines properly,” he said. Dzongdas asked however questioned their relevance in signing such a compact. The director general explained that it’s vital for dzongdas to be involved in the hospital’s transformation because they are district heads who oversee the district’s management. “The signing is for accountability and monitoring progress,” he said. Now the hospital management would have to prepare a report and submit it to the dzongdas. The dzongda after going through the report will forward it to the health ministry, who will then analyse the report and submit to the gross national happiness commission. The final report would then be submitted to the prime minister. Such reports according to the compact should be submitted every fortnightly to the health ministry. Dzongdas said the compact would definitely benefit people. “But this would require hardworking people to implement the compact properly,” Thimphu dzongda Lhab Dorji said. The HAMT will be implemented in 26 hospitals and 11 BHUs from February 1 this year. The next compact signing will be between dzongdas from the central and eastern region.